Another Google I/O, another jam-packed Android session room. This year they nearly doubled the room capacity for the main Android track making space for 1,000 seats. That still wasn't enough though - once again people were sitting on the floor and lining up to get in. 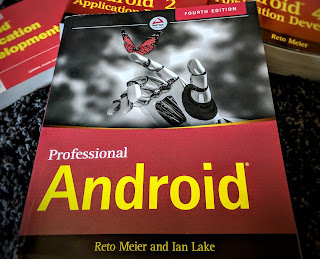 After delivering my Android Best Practices for Beginners for the better part of last year, I was really excited to take things up a notch and deliver some real advanced content. 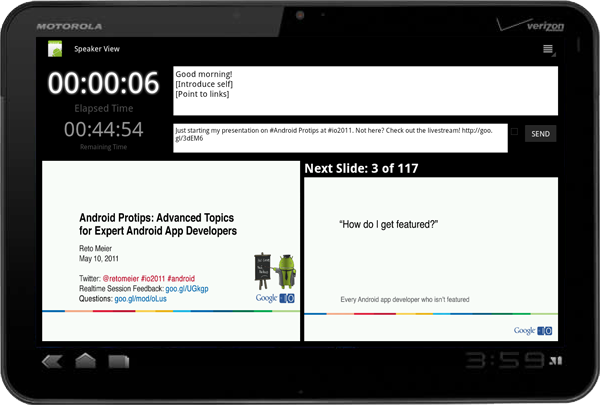 To push things one step further, I presented my session using a pair of Xoom tablets. More on that after the video. The awesome video content was created for me by an old friend of mine (he's still young, but we've been friends since high school) pandamusk - thanks panda! How did I live tweet my own presentation in real time? How did I not re-tweet everything when the tablet rebooted? One app, running on two tablets, both running Android 3.1 (with USB hostmode support) connected via Bluetooth. Tablet one was wired up with HDMI out and a USB-connected clicker let me transition between slides. I added a "finger paint" View with a transparent background on top of the ImageView that displayed each slide which let me do the real-time annotations. A second device (out of sight on the lectern) showed me my "Speaker View": My speaker notes, the current / next slide preview, my pre-written live tweets, and a countdown timer. The two devices were paired and connected over Bluetooth, with the speaker view tablet set up as a slave to the presentation device. Whenever the display tablet transitioned slides, it transmitted the current slide to the speaker view tablet. It works the other way around too, so I can transition slides on the speaker view and have the live view update accordingly. The tweeting happened on the speaker view tablet based on slide transitions (with a button for me to disable it if — for example — I had to restart half way through). I connected this one to a wired ethernet connection using a USB to ethernet dongle to avoid the notorious conference wifi syndrome. I've got a bunch of ideas I'd like to incorporate (particularly around remote viewing), but ran out of time before I/O to get them implemented. Yes and yes. I need to make a few improvements before I release it on the Android Market and I need to refactor and tidy the code before I open source it. In the mean time I'll do a couple more posts the go into more detail on how each of the components work. Stay tuned. Whoa. That's even cooler than I thought it would be. Great idea to have the 2nd tablet Speaker View. Can't wait to see the source code. And I really need to buy a Tablet to test these functionnalities ! @Alberto: Absolutely. A smartphone version is a high priority. Will need a UI rethink, but definitely doable. The smartphone wouldn't need USB host mode (that was just to ensure WiFi connectivity). The devices communicate over Bluetooth. Thank you for this really inspiring talk and that hopefully soon comming app. Wow, you had some really nice ideas! Hope to see the source code soon. So cool! I can see this being really useful if I docked my tablet to an HDMI out and controlled the presentation with my phone! Sweeet! As a fellow programmer I have to say, THIS IS SO BADASS! This is a really nice idea and implementation for presenters! Well...projector + netbook is still better but for a purely Android implementation, this is pretty good. Could it be possible to show notes on one tablet and pull the slides from the same tablet and show those only on the projector? 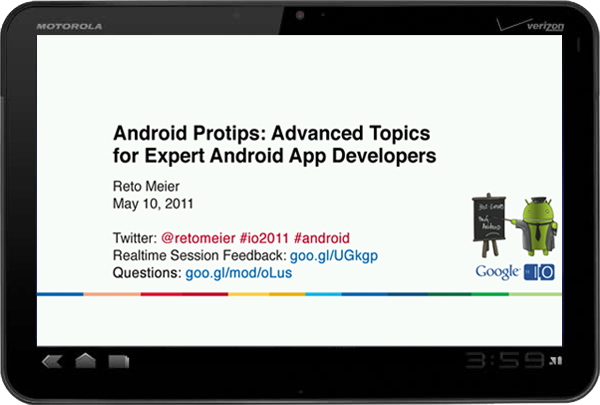 Hi Reto, I enjoyed this presentation, and I am trying to get the PDF of the slides and related code, but the server is giving a 404 on this link : http://www.google.com/events/io/2011/sessions/android-protips-advanced-topics-for-expert-android-app-developers.html (the "session presentation" link). It appears to be a problem for other google i/o session notes as well. Any help? Very good presentation. Loved the videos! I have watched it twice now looking for more nuggets. I can't wait to be able to examine the source code for the app. Wow - seriously freaking cool! Can't wait to see the code and try this out...I was at IO and was trying to figure this one out during your presentation (which was also really good!). Can't wait. This is great. Couldn't find any where how to embed video in presentation on a tablet . Hey Reto, any updates on this software? I am a worship leader at my church and would love to control the presentation from my Tablet! Superb app! I really really like it! Just one factor, what about individuals who don't have two pills. Wouldn't it be better to have a presenter notices edition for phones? Maybe just being able to publish to tweets, see present fall and enough time. I'm not a UI developer but I think it could be possible. And it could be awesome to add actions, if you fall to the right, next fall, to the remaining, previouse fall.